Hi, friends! 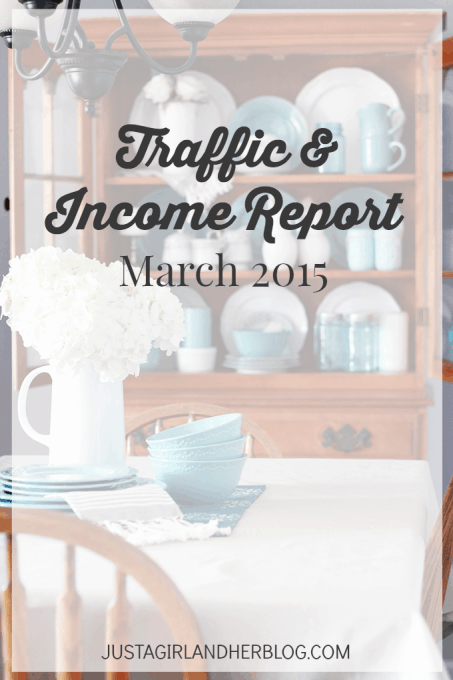 Welcome to the Just a Girl and Her Blog monthly income report! If we’re being honest, I always wake up a little nervous on these days. There is just something kind of scary about pulling back the curtain and revealing the inner workings of this little old blog of ours, but you all have been incredibly supportive as we’ve shared our journey, and we are thankful to you for that! We started doing income reports over a year ago because we really have a heart for helping other bloggers, and we thought others might benefit from seeing what was and wasn’t working for us as we attempted to grow our online business. So when Donnie started adding up the March numbers and we were within $100 of our best gross month ever and had our very best *net* month ever, I was completely shocked! As always, I am so thankful to you guys because YOU are the ones who make all of this possible, and your support of Just a Girl and Her Blog amazes me day in and day out. Thank you, thank you, thank you! A couple of new revenue streams appeared this month: a private ad buy, The Art of Work affiliate income, and Ultimate Bundles. These aren’t long-term strategies but rather a few temporary opportunities that we thought were a good fit for the blog. I don’t want to get preachy here, but Abby and I are always aware of these two traps that can erode readers’ trust. There’s a fine line we try not to cross, and we think long and hard before we promote anything. A quick win or “easy affiliate money” can be very detrimental to your readers’ trust in the long-term. 1. Most months our expenses as a percentage of revenue is below 10%. I think this is a more than healthy number for an online business. If it was much below 10% I would question whether or not we were taking advantage of the best tools out there, and anything over 15% would make me nervous. At that point I would consider trimming some of the tools and services we subscribe to. 2. If a tool or service saves us time, it’s money well spent. In running this online business, time is the most valuable commodity we have. We try to avoid activities where we are directly trading time for money (coaching, consulting, etc.) and instead choose activities and business models where time is leveraged. For this reason, Abby and I are constantly on the lookout for tools and strategies that will give us back some of this time. Some of these tools cost money, but we would gladly spend $15/month for something that will save us an hour of time each month. The one caveat here is that we remain in the 10-15% range of expenses as a percentage of revenue. These aren’t hard and fast rules and my thinking will probably change over time, but it’s worth it to consider your business expenses. It’s easy to go too far in either direction… Abby naturally likes to avoid paying for any extra services, and I naturally like to sign up for and try just about anything. We balance each other out! It now seems crazy that I used to believe a “healthy” blog should generate 1/3 of it’s income from ad revenue. Now, if our ad revenue was 1/3 of our income it would mean that we were missing out on a tremendous opportunity of creating and selling our own products as well as promoting other products as affiliates. It will be interesting to see what part of our income will come from ad revenue over the next year. If it starts to dip below 10%, I may seriously question its long-term importance for this blog. What do you guys think about ads? Do you think they’re an important income stream for most blogs? Traffic still seems slow after a crazy January, but after looking at the overall trend it’s still encouraging to see that we have a nice and steady upward trajectory. Nothing is fast, but we’re in this for the long term! If I was only allowed to track either pageviews or email subscriber statistics, it for sure would be the email subscribers. As Abby and I launch The Paperless Home and other products in the coming months, there will be nothing more important to the success of the launch than our email list. It’s the only direct line of communication we have with our readers and is infinitely more valuable than social media numbers or even pageviews. I know I’ve said this before, but the longer I blog, the more I see how important it is to have a solid email list! Readers get the chance to know you better through periodic emails and therefore come back to your blog again and again. Through offering various “mini-courses” and opt-in opportunities, we have been able to hone in on what our readers are most interested in seeing. For example, we have a segment that signed up because they wanted to learn more about organization, another segment that is more interested in information about blogging, another segment who wants to know more about going paperless, etc. This helps us serve our readers better by giving them more of what they want and less of what they don’t. Because our email list is becoming more and more complex like Abby mentioned, I plan on rethinking and re-evaluating our email strategy later in April in order to tighten it up even further. There may be some big changes to come! Of course I’ll explain everything in these income reports. RPM is a metric to track revenue per thousand pageviews. This is a measure of the overall effectiveness of a blog and is a handy benchmark for comparing blogs even if they have vastly different traffic numbers. I first learned about this metric from Bjork from Pinch of Yum. There is a very exciting event happening around here next week! 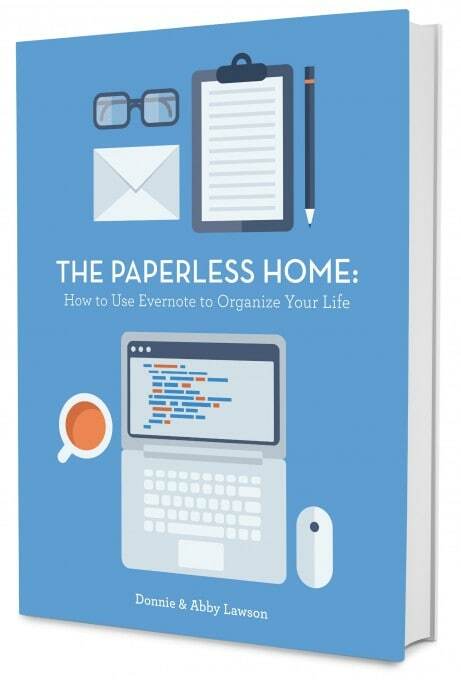 Donnie and I are *thrilled* to be launching the first eBook we have co-authored, The Paperless Home: How to Use Evernote to Organize Your Life on Monday, April 13th. Sure, going paperless has helped us keep our home, bills, and personal information organized, but it has also played an essential role in helping us run an efficient and effective home business. Collaboration is seamless; the paperless tools we use help us to stay on the same page with projects and deadlines. The legal side of our business– from taxes to important documents to account information– is always in order and easily accessible to both of us. I can confidently say that both our home and our business have benefitted greatly from our paperless system. If you’re interested in learning more about going paperless, snag your free sample chapter of the eBook here! Thank you so much for all of the encouragement and support you’ve given us as we’ve made this blog our full-time endeavor. We are so thankful for you and truly appreciate all you do for us. Have a wonderful week! This is fascinating news. I’m very happy for your success! I’m just wondering if you keep a monthly record of how many hours you worked to produce these results. If you know, would you mind sharing? Thanks and keep up the great work! Hi, Jessica! We don’t keep track of exact hours, but this is both Donnie and my full time gig, so we each spend at least 40 hours each week on it. I hope this helps! Have a wonderful weekend! Thanks for sharing as always,! I am curious if the scanner sales from Donnie’s website and paperless system is also included in the affiliate income or is the affiliate sales soley from Just a girl and her blog affiliate income. I look forward to seeing the tweaking you do with your email list. Thanks again and hope you have your best month ever in April! Hi, Diane! The affiliate sales listed are from Donnie and my blog combined, but almost all of the sales to this point have been from the posts he wrote on Just a Girl and Her Blog rather than his site. I hope this helps! Have a wonderful day! Thank you so much, Jennie! We’re excited about it! Hope you have a wonderful weekend! Your RPM numbers have been AWESOME! Thank you for your transparency – it’s inspiring to know what is possible with good planning and hard work! Thank you so much, friend! Have a wonderful weekend! Thank you so much, Nicola! I’m glad the posts are helpful. Hope you have a wonderful weekend! As a new blogger, it is always so encouraging and exciting to see this post. You might be really nervous before you post it, but I am always eagerly awaiting it! Thanks for your help! Thank you so much, Sarah! I’m glad the posts are helpful! Hope you have a wonderful weekend! I really appreciate your transparency about your numbers. It gives me a lot of ideas for the future in terms of monetizing my own blogs. Thanks, Miriam! Have a wonderful weekend! Every month I check in, breath held, asking, “did they do it?! did they do it? !” and then I’m cheering when I see that the answer is always a resounding yes. You two are KILLING it! I love it! I love your perspective on recurring expenses as a function of total revenue. I think 10% is a great benchmark to keep in mind. Now for those of us who have yet to launch that first product tied to our site… it’s a little more difficult! But I hope to keep that 10% in mind as we move forward with our business. As for ads, it seems that more and more they don’t necessarily have to be part of a site’s winning strategy. I certainly don’t mind the ads on Abby’s site – they blend in fine, but like you said, they make up a small percentage of the overall revenue. I think it used to be that people would monetize their blog almost solely through ads. They would build it, eventually get traffic, throw up some ads, and call their blog a business. But ads aren’t paying what they used to. 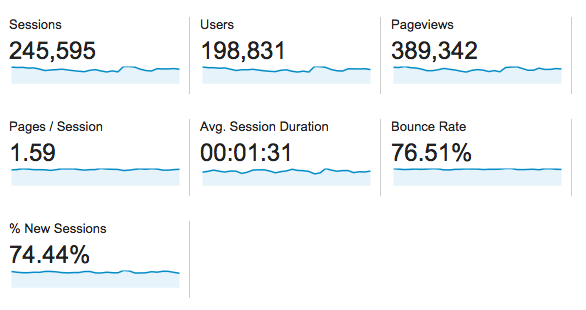 So yeah… I say keep ’em if they’re not slowing the site down, affecting bounce rates, affecting readers staying around. But definitely keep on creating those awesome products of yours (as you have been!) because those play a much larger role in your success. And man, that Bluehost affiliate – so cool! Thank you so much for your encouragement, Beth Anne! That really means a lot! Hi! Thanks so much for sharing your income report. I always like to read these. 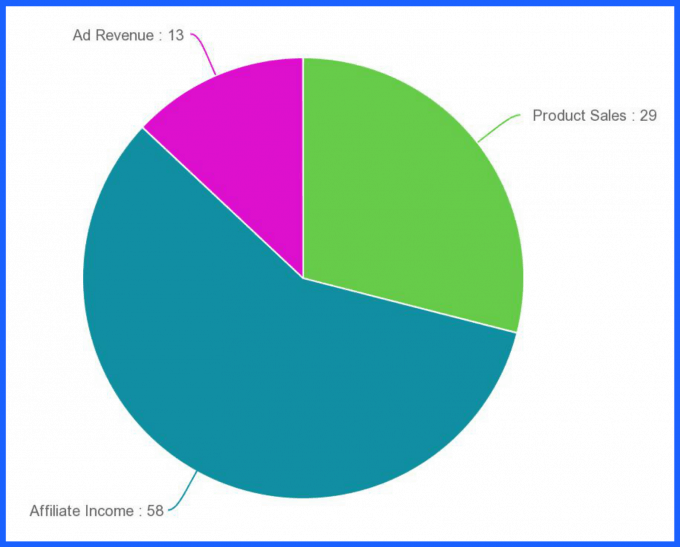 It seems to me like most of the blogs who release their income report make most of their money from affiliate income from hosting sites and from eBooks. I am so happy for your success! Thanks so much for sharing again! Congratulations on an awesome month. You guys are amazing. I am loving the private FB group you created. You are both so incredibly helpful. You deserve every ounce of success you receive. I cannot wait for your new ebook. I am excited to start going paperless. Thanks! Wow! This is the first report of yours that I’ve read… amazing and very encouraging. I do have a couple of questions… maybe they’re written on some posts that I haven’t found yet, if so, could you just point me in the right direction? 1. How/what is the bluehost affiliate income? Is that just from when you talk about using them and you have the link for them? And are you working directly with them for that affiliate income, or through another source? 2. I assume that the e-books income is from e-books you’ve written and have sold for the month. What was your cost to write the book? Thanks for reading Liz! Hopefully I can answer some of your questions. 1. We earn Bluehost affiliate income when someone signs up for Bluehost hosting through one of our links. It’s our favorite hosting provider with a great price and great service and we recommend them whenever we talk about starting a blog and choosing hosting. We work directly wtih Bluehost. Hopefully that answers your questions! Have a great day! I’ve been reading a lot of income reports from other bloggers lately as inspiration for myself and my blog that is fairly new, and yours has been my favorite by far! You are extremely thorough in explaining where everything is coming from, as well as providing actionable advice for what worked and what didn’t. This is such an awesome resource for new bloggers like myself, thank you for being so open and sharing!! Love these income reports! What do you use to cloak your affiliate links? I’ve been trying to do the same! Thanks for the transparency and for empowering, encouraging, and inspiring us that it can be done! Glad I found your blog through Miss Information. I’m blessed to read about your success. More blessings to you and your blog! Hi, amazing pervormance of your blog. Good job! Best wishes from Germany. Thank you for sharing! This is very helpful for new bloggers! Your story and income reports are encouraging. I stepped away from blogging for about a year and I feel like I’m brand new again. Your reports, tips and advice are very helpful as I try to once again grow my blog and monetize it. Thanks for being willing to share!